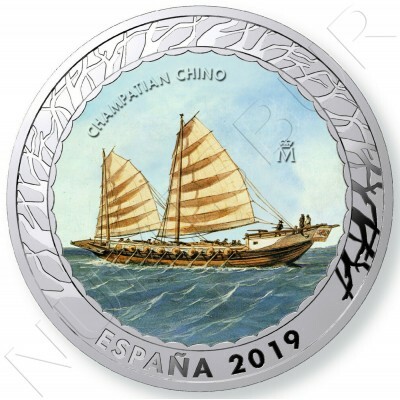 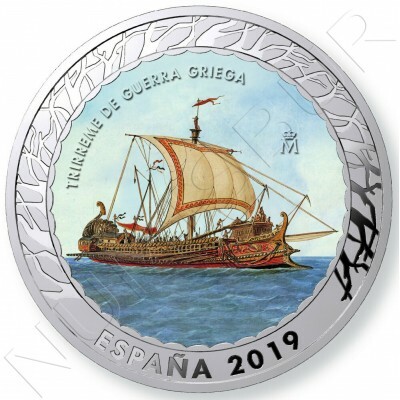 Second edition of the History of Navigation series.Features:Composition: cupro-níquelFacial value: 1,5€Weight: 15 gramsDiameter: 33 mm..
2 escudosThis coin represents a piece of eight shields of Philip IV, minted in 1632.The obverse reproduces the obverse of this piece, with the exception of the trademark of Ceca and the legend of "ESPAÑA 2019", as well as the value of the piece of 100 EURO, included in this issue. 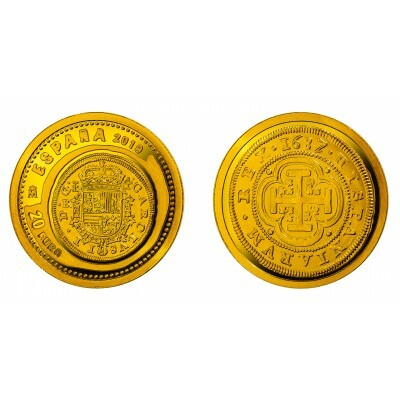 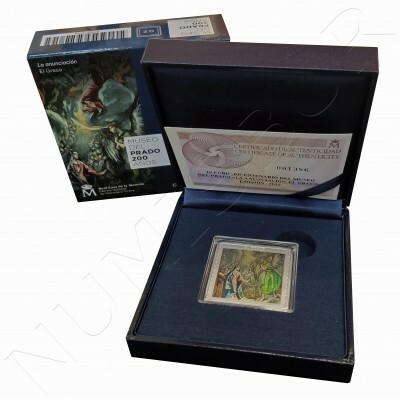 The reverse reproduces the reverse side of the original coin. 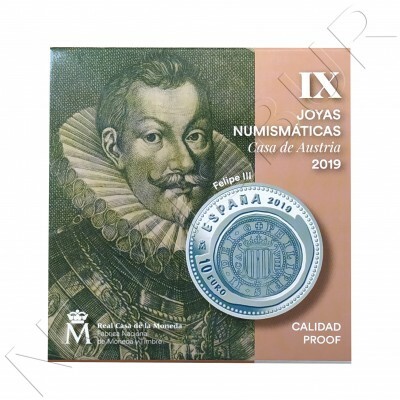 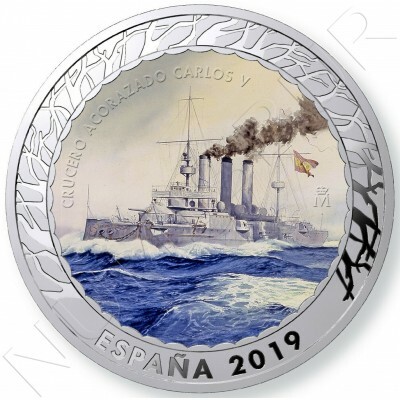 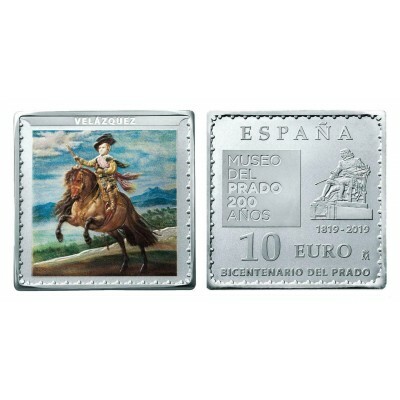 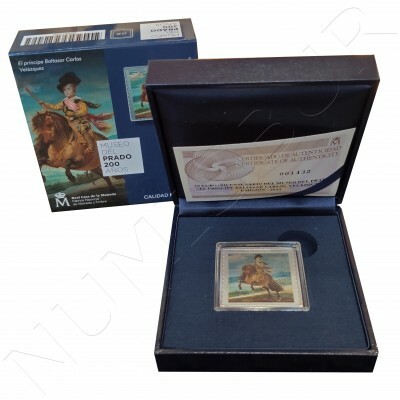 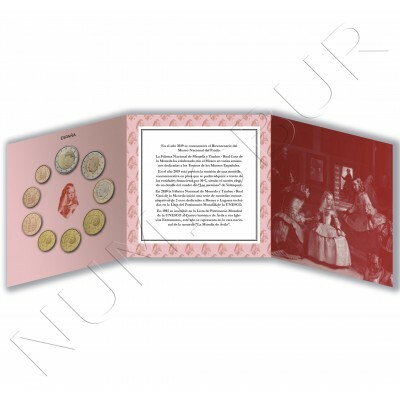 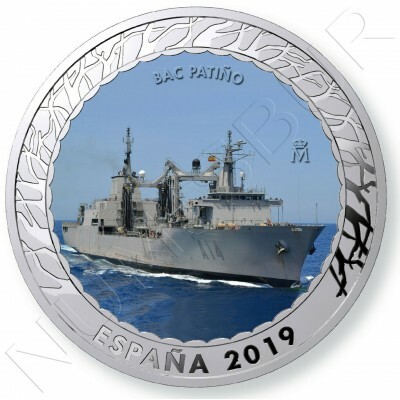 Composition: Gold 999 thousandths Face value: € 100 Weight: 6.75 grams Diameter: 23 mm Maximum print run: 2,000 pieces..
Name: 8 realesFace value: 10€Weight: 27 gMetal: Silver .925mmDiameter: 40 mmQuality: PROOFMintage: 5.000..
10€ SPAIN 2019 - La maja desnuda "GOYA"
VI Treasures Series Spanish Museums - Bicentennial of the PradoRepresents a fragment of the work «The Annunciation», made by Domenicos Theotocopoulos, El Greco, between 1597 and 1600.Quality: PROOFMintage: 5.000Metal: Silver .925mmDimensions: 36x36 mmName: 8 realesFace value: 10€Weight: 31,41 g..
10€ SPAIN 2019 - Prince Baltasar Carlos "VELAZQUEZ"
VI Treasures Series Spanish Museums - Bicentennial of the PradoPresents the play "Prince Baltasar Carlos, on horseback" made by Diego Rodríguez de Silva and Velázquez between 1634 and 1635.Name: 8 realesFace value: 10€Weight: 31,41 gMetal: Silver .925mmDimensions: 36x36 mmQuality: PROOFMintage: 5.000..
10€ SPAIN 2019 - The announcement "EL GRECO"
VI Treasures Series Spanish Museums - Bicentennial of the PradoRepresents a fragment of the work «The Annunciation», made by Domenicos Theotocopoulos, El Greco, between 1597 and 1600.Name: 8 realesFace value: 10€Weight: 31,41 gMetal: Silver .925mmDimensions: 36x36 mmQuality: PROOFMintage: 5.000..
Esta moneda reproduce el anverso y reverso de una pieza de cuatro escudos de Carlos II, acuñada en 1687. 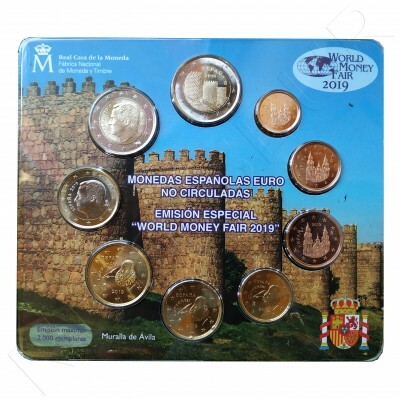 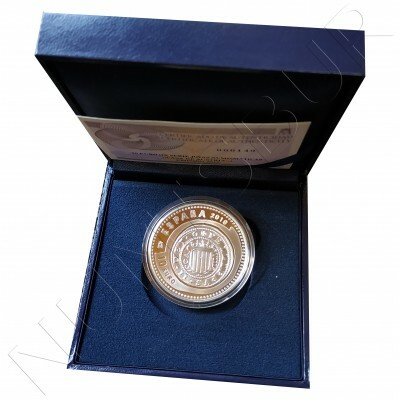 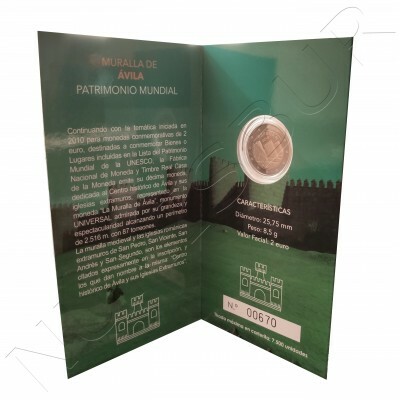 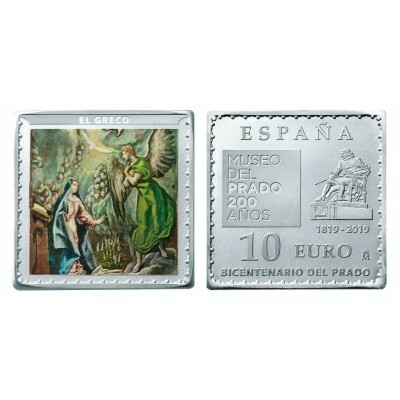 Moneda de 13,92 mmComposición: Oro 999 milésimasValor facial: 20 €Peso: 1,24 gramosDiámetro: 13,92 mmTirada máxima: 5.000 piezas..
2 euros coin of SPAIN 2018 in commemoration of Wall of avilaThe coins, which will be minted on behalf of the State, will be delivered to the Bank of Spain to make them available to the public. 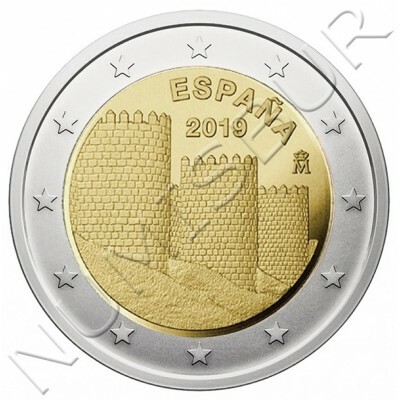 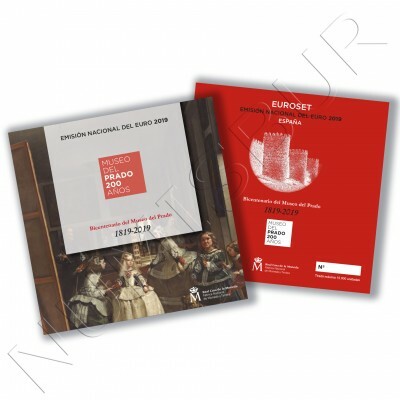 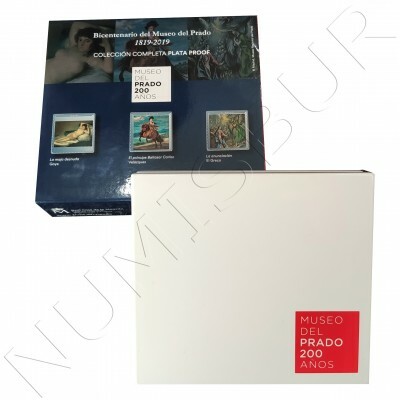 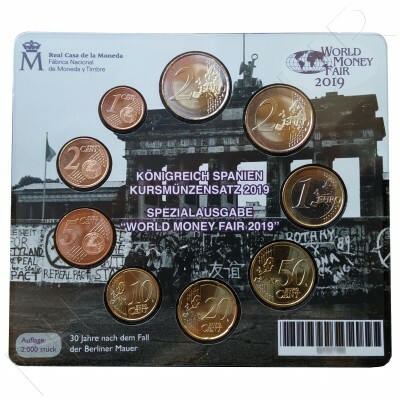 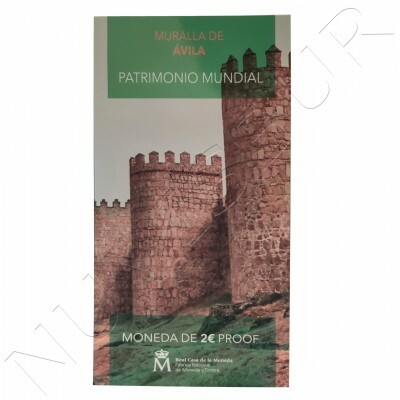 For this, the collaboration of the credit entities will be available, which may submit their requests to the FNMT.Country: SPAINFacial value: 2 eurosYear: 2019Weight: 8.5gDiameter: 25.75mmQuality: S/CMotive: Wall of avila..
Country: SPAINFacial value: 2 eurosYear: 2019Weight: 8.5gDiameter: 25.75mmQuality: PROOFMotive: Wall of AvilaTirada: 7.500 pieces..
Descripcion: 3 coins 10 eurosComposition: Silver 999 thousandthsFace value: € 10Weight: 31.41 gramsDimensions: 36x36 mmQuality: Proof Maximum roll: 5,000 units per model..
Country: SPAINFacial value: 3.88 euros + 2 euros conmemoratives 50 anniversary Felipe VI + 2 euros conmemoratives del wall of AvilaYear: 2019Issued: 20000 pieces..
Country: SPAINFacial value: 3.88 euros + 2 euros conmemoratives Year: 2019Issued: 2000 pieces ..